Gator Case's new Tablet/Mix bag provides an all-in-one carry solution for the new wave of iPad presenters, designers, musicians, and enthusiasts. Apple's iPad has proven to be an incredibly versatile tool with a world of powerful downloadable applications emerging exponentially. The stylish Tablet/Mix bag provides rugged protection for your iPad or similar sized tablets and small format mixers or docking stations. The new Tablet/Mix bag is a messenger style carry bag made of a lightweight nylon material. A fitted sleeve holds an iPad and the see through cover allows quick access and full use of the iPad without removal. Zippered access also allows you to quickly remove the iPad without opening the outside flap. The larger main compartment features a thick padding and is designed to hold small compact mixers or docking stations. 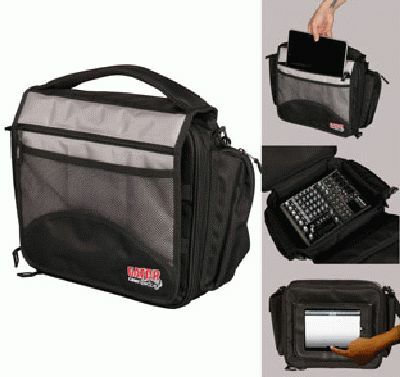 Large zippered side pockets allow storage for microphone, power supply, cables, and more. Lastly, the bag features an EVA soft grip handle and adjustable shoulder strap. This unique iPad transport solution, the G-TABLETMIX-BAG, is available immediately from your authorized Gator Cases Dealer.